Exceed limitations and accomplish your goals more easily! 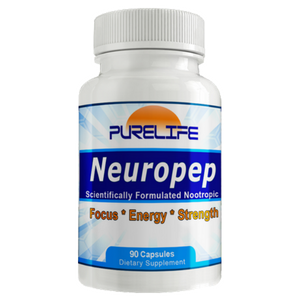 Neuropep is the ultimate product to optimize brain function for your high performance lifestyle. The mind and body connect through your neurological system. With Neuropep, you can strengthen that connection for improved neurological function in every area of your life including work, school, and the gym. Neuropep amps up key performance factors such as blood flow neuronal firing, and communication, and recovery and regenerating factors like Nerve Growth Factor (NGF). The ingredients in Neuropep also protect you from toxins, oxidative stress, excitoxicty and physical trauma. Neuropep features a new and potent combination of scientifically proven ingredients designed to help you feel and perform better! N-Phenylacetyl-L-Prolylglycine Ethyl Ester: This amino acid peptide has been shown to improve many aspects of brain function including focus, cognition, memory, and learning. May also increase physical strength. Vinopocetine: Studies show improved cognitive performance and memory in addition to increasing blood flow to the brain. Methyl-Cobalamin: The active coenzyme form of B-12, it's been shown to aid in cell growth and replication. Besides enhancing brain function and nerve conductivity, it also helps maintain a healthy sleep-wake cycle. As a dietary supplement, adults take 1 capsule twice daily or as needed. WARNING: Keep out of reach of children. Not intended for those under 18 years of age. Consult with a physician if pregnant, nursing, or on any medication. I’ve tried a number of different products promoting concentration and the ability to focus, and Neuropep works best for me, hands down. A huge plus, that I wasn’t expecting, is that it not only helps me focus better, but it has also had a positive effect on my depression. So much so, that I take one capsule every day, and when need be, sometimes twice a day. It’s not a miracle drug, but honestly, since I’ve been taking Neuropep, I feel so much better overall. This amazing product has helped my focus and concentration. Great for those times when I need to perform activities that require decision making and feel my mind is too tired. Really good!